The word stress has become something of an everyday topic. It’s something we all deal with, almost from the moment we wake up to the moment we fall asleep. As a parent, I have developed the ability to not only experience outside stressors – hello to my youngest, who does not sleep – but also the ability to create MORE stress in my own mind. Imagine any nightmare scenario, and I probably have debated what I would need to do in the event it actually happened. I don’t remember being this way before having kids, but the inner workings of my neurotic parent brain is probably a topic for another blog post. This is about stress and our ways of dealing with it on a daily basis. This article isn’t just for parents. It’s for anyone who’s ever been described as a perfectionist. Someone who has a “Type A” personality. A college student with a full class-load who also has to work to pay tuition. Nurses, doctors, and hospital staff who work insanely long hours and have to deal with the emotional toll of healing or saving someone’s life. It’s for anyone who has ever felt there are not enough hours in the day or who has worried whether they are doing enough or doing anything right at all. Before I dive into my thoughts and suggestions for dealing with our day to day stress, I need to veer off a tiny bit into some anatomy/physiology to give you some important details about how our bodies work. I’m sure you’ve either heard someone mention or have read some article somewhere about the the central nervous system and its connection to training. The CNS consists of the brain and spinal cord. It processes sensory input in order to tell the rest of the body what to do via the PNS, or peripheral nervous system. This is important with regards to training because basically these two systems are responsible for initiating and carrying out muscle contraction during our workouts. Our nervous systems are responsible for many training adaptations, and if that system is fatigued – if we train too often, with too much volume or too high intensity for a prolonged period of time – performance will suffer. The lesser known or talked about part of our nervous systems is the autonomic system. While the CNS/PNS controls our conscious movement, the ANS is responsible for all of our bodily functions that happen without us thinking about them like heart rate, digestion, and all other internal organ function. The two branches of the ANS are the sympathetic nervous system and the parasympathetic nervous system. Still with me? Ok, let’s keep going. These two branches have opposing jobs. The sympathetic system is our “fight or flight” branch and the parasympathetic system is our “rest and digest” branch. Our bodies are designed to be in the parasympathetic state for most of our day and to only use the sympathetic system for truly life-threatening experiences. If you think back to our caveman ancestors and the way they lived their lives, most of the time was probably spent sitting or sleeping or walking – they were literally resting and digesting for a majority of the day. From a training, or more importantly, from a recovery standpoint, we want the parasympathetic system turned on as much as possible to promote system-wide rebuilding and rest, especially if we are training with progressive volume and intensity from week to week. I’m not saying that caveman had it easy. Say he’s being chased by a bear. Does he want a mellow, rest/digest mindset? No way. He is running or fighting it for his life, heart pounding out of his chest, adrenaline pumping. The sympathetic nervous system is turned on for these “fight or flight” situations. In caveman times, those instances were (hopefully) few and far between. In 2016, the time we spend in either of these states is almost totally opposite – much of our day is spent in a sympathetic state. We are perpetually stressed out from any number of things on any given day. Life is fast paced and demanding, and I’m sure many of us feel like we’re being chased by a bear once or twice a day before it’s even lunchtime. I know it’s not practical to just give up your job and move to a deserted island where you can eat anything and not gain weight and sleep in as late as you want…so the question is what can we do in our current situation to bring about a more “rest and digest” state in our bodies? One– It must be something you enjoy. This may seem obvious, but it is the most important rule! Two– You have no expectation about the outcome, nor do you feel any pressure to perform in a certain way. Pressure = stress. Expectations can lead to letdowns. How you choose to spend quality time needs to be free from any emotional attachments or expectation of how you actually experience it. Three– You leave the experience feeling refreshed or energized, not tired or rundown. Not much clarification needed here. ANY TIME you feel like you are running low or dragging, your body is most likely viewing that as a stressful situation. Four– It must be something that pulls you into the present. No comparisons to the past, no worries about the future. Be fully present and focused in the here and now. Now you’re probably thinking “Gee Becky, that sounds great and all, but I literally have 491 things to do in a day, how am I supposed to find time to do something that meets all of these standards?” Trust me, I understand where you’re coming from. When it comes to promoting a parasympathetic state in your body, sometimes only a few minutes is all it takes. When you’re stuck in traffic and can feel your anxiety levels rising, close your eyes. Breathe deeply. Take a few moments to focus on your inhale and exhale. When your kids get into their fifth screaming match of the morning, step into another room. Close your eyes. Breathe deeply. Very recently I have been experimenting with this type of beginner level meditation. I consider it my five minutes of daily “me time” because it fits every rule listed above. I think people tend to shy away from the whole concept of meditation because they feel they need to have some sort of life changing experience where their mind completely shuts off for 30 minutes and they reach this Zen-like state. If this is what is keeping you from trying it, go back and read rule #2. Push aside any preconceived notion you have surrounding the concept of meditation and just try it for even one minute today. Lay down and let your mind relax. Focus on your breathing and what the surface you’re laying on feels like. There is no right or wrong way. Before writing this post, I asked my Facebook friends to tell me ways they de-stress. No one really mentioned meditation; the gym was far and away the #1 popular answer. But is it really a legit use of your “me time” based on the above criteria? If you’re anything like me, usually you are already under a time crunch before you even start your drive to the gym. Maybe you had to stay late at work or you slept through your 4:30 alarm that morning or you spent an extra ten minutes hearing about your 4-year-old’s day at preschool before you left. As soon as you get in the car you’re already counting down the amount of time you’ll have in the gym to actually work out – as long as there’s no traffic, as long as you hit green lights, as long as you get right to work and not talk to anyone for too long. You’ll have to cut your warm up short to fit in the entire session or skip your movement routine at the end so you can leave on time. Of course, you hate having to cut corners but you can justify it with a simple thought – at least I’m here. At least I’m working out. It’s better than doing nothing, right? THIS IS MY “ME TIME”. If you’re anything like me, all of the rushing around and cutting corners leads to a lot of anxiety and a lot of stress in addition to the stress accrued during your workout. 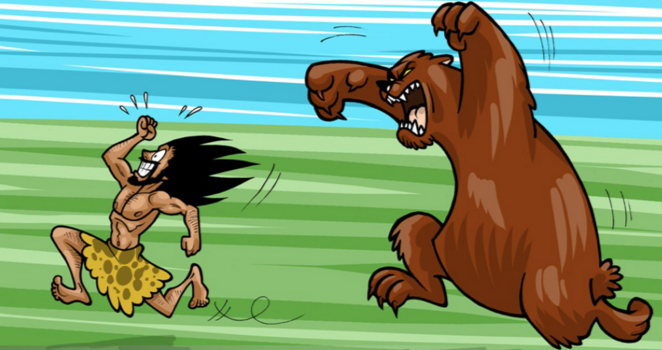 Your body doesn’t know the difference between being chased by a bear and having to do Fran. All it knows is heart rate is up, you are breathing heavy, you are feeling scared (especially in the case of Fran!). But wait, this is something that is supposed to help you de-stress! It’s “ME TIME”! Well, I hate to break it to you, but this is not a way to reduce stress in your life. You may feel awesome and energized afterward, but that’s just the adrenaline talking. However, all hope is not lost. The structure of your training session can be designed to keep you in that parasympathetic state. Movement or flow work, slow spins on the bikes or an easy row, and breathing practice are just a few legit suggestions for ways to train with the added benefit of not flipping the sympathetic system switch. These types of sessions hit every rule listed above. I hope you learn to enjoy these sessions as they promote overall health and quality of movement. I hope you do not attach any pressures to an easy bike and stretching routine. I hope 60 minutes of easy movement leaves you with a positive, energized feeling. I hope you are fully present through the session; put your phone away and focus on quality of movement. Even just spending 10-20 minutes after your workout to stretch and spin on the bikes is a good way to initiate a parasympathetic response in your body. The moral of the story is you need to really examine the way you spend your given minutes in day. If you are feeling overwhelmed and stressed out, what are you doing when you have time for yourself to truly promote lowering your stress levels? Remember the criteria above and put it into practice when you feel you need some “me time”. Give your body a break from the daily bear chase, and it will thank you.